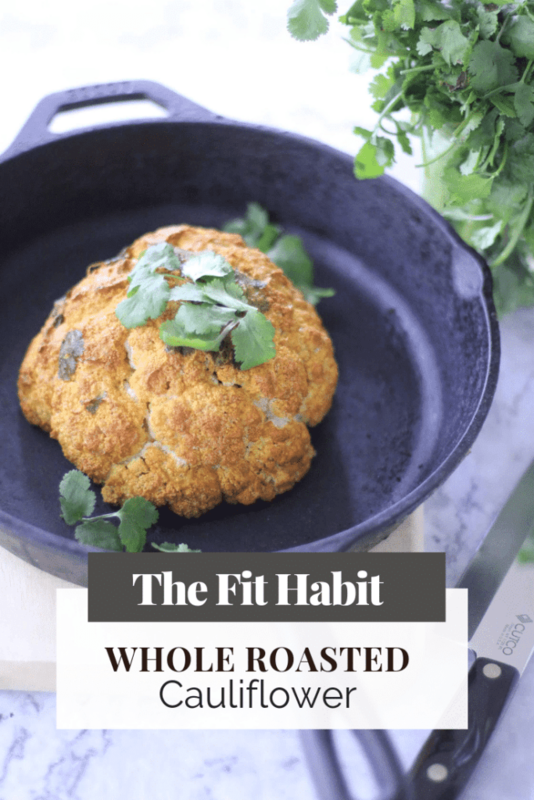 Whole, roasted cauliflower is a simple, beautiful dish that’s perfect for holiday meals or just a weeknight dish. Vegetarian or not, you’re going to love how it looks and how it tastes! We just got back from a 10-day trip in the Desert. It wasn’t exactly a vacation as I worked the whole time, but it was so nice to be in warm, sunny weather and taking occasional work breaks to dip in the pool. It’s been a rainy winter here in NoCal, so I needed that solid dose of sun, even if I wasn’t entirely in vacation mode. But now I’m back to reality and fortunately, back to my kitchen! I’ve been wanting to share this recipe since visiting my favorite Indian restaurant in SF a few weeks back. 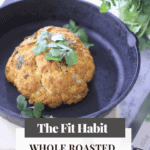 They had a whole roasted cauliflower on the menu and it was so freaking good! I love that this recipe makes a vegetable the centerpiece of the meal. This is something you can carve into, much like a turkey. For that reason alone, it’s perfect if you have dinner guests that don’t eat meat. In fact, I think your carnivore guests will be jealous at how interesting and gorgeous this looks! Do you have to bake it in an Iron Skillet? No, bake it in whatever you want, but I do think the skillet adds a visual weight to the dish. What if I can’t eat Dairy? Simple – just double up on the coconut cream and just ditch the yogurt (or use a dairy-free alternative). 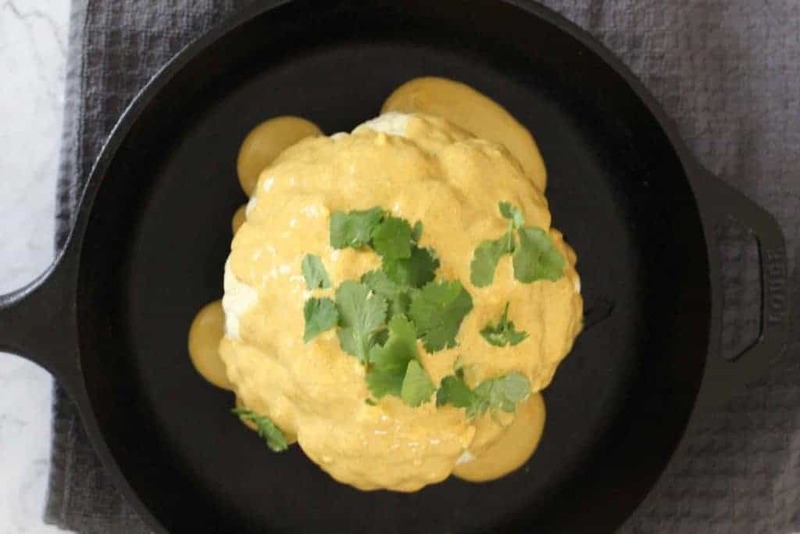 Because I know you’re probably wondering, yes – you can use coconut milk instead, but it’s not as thick as coconut cream, so it might not cling to your cauliflower as well as a cream-base will. I also think this would be great with a simple pre-made curry sauce (this is my all-time favorite brand) if you don’t want to go to the effort of making your own. In fact, I’ll probably do that myself this week. 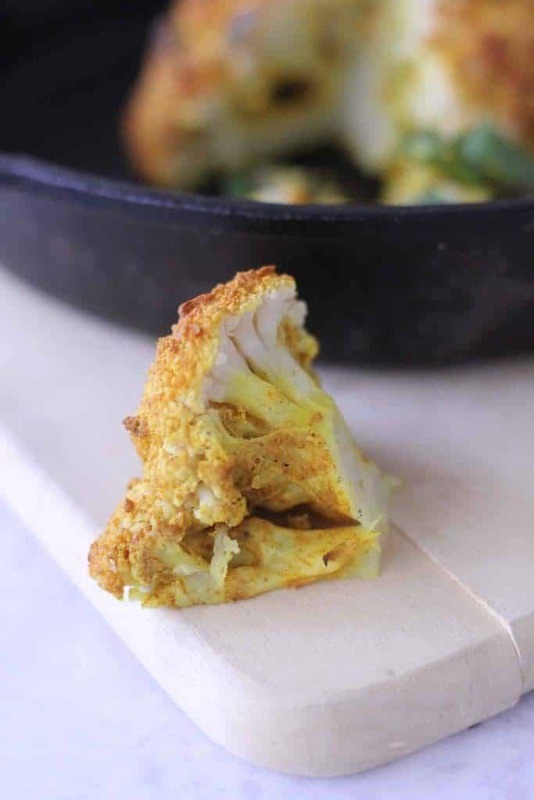 If you don’t want to roast the whole cauliflower head intact, you can always break it up into florets and toss them in the curry mixture before roasting. You may want to reduce the cook time in this case, but it depends on how big your florets are. You could also pour this mixture into a pan of cauliflower rice and call it an Indian Cauliflower Risotto. In fact, I think that would be awesome. For sure! Just tell them you whipped up a human brain for dinner and invite them to cut into it. 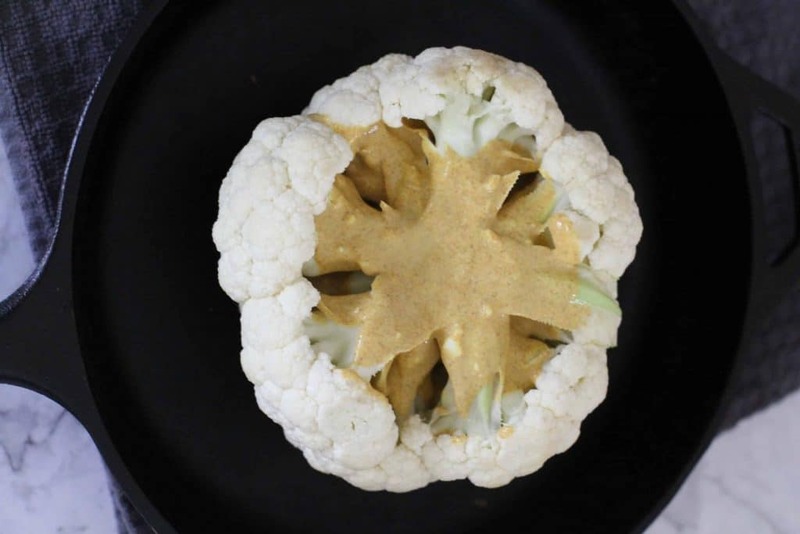 Once you’ve cut off the stem of the cauliflower, be sure to pour half the mixture in the bottom end. That will ensure it coats the inside of the cauliflower head, giving you a much better overall flavor. I think any combination of Indian sauces and cauliflower is a winner. You simply can’t go wrong here, so have fun with it and enjoy the results! A simple, but beautiful centerpiece to any vegetarian meal. Perfect for the holidays or even a weeknight meal. 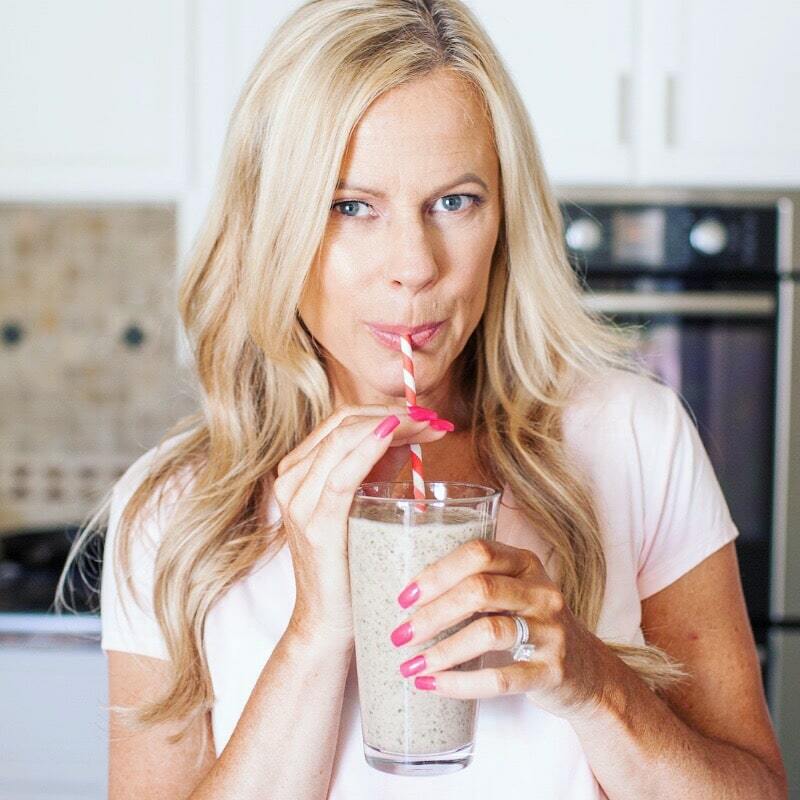 Read the post for more ideas on how to simplify the recipe and make it dairy-free. Create mixture in a small bowl. Flip the cauliflower over and fill the base with half of the sauce so the underneath is well covered. Flip back over and place in a baking dish. Remove tinfoil and bake for another 20 to 25 minutes or until a knife can Pearse the cauliflower easily. gah! Thanks for letting me know. Hope it turned out well for you! 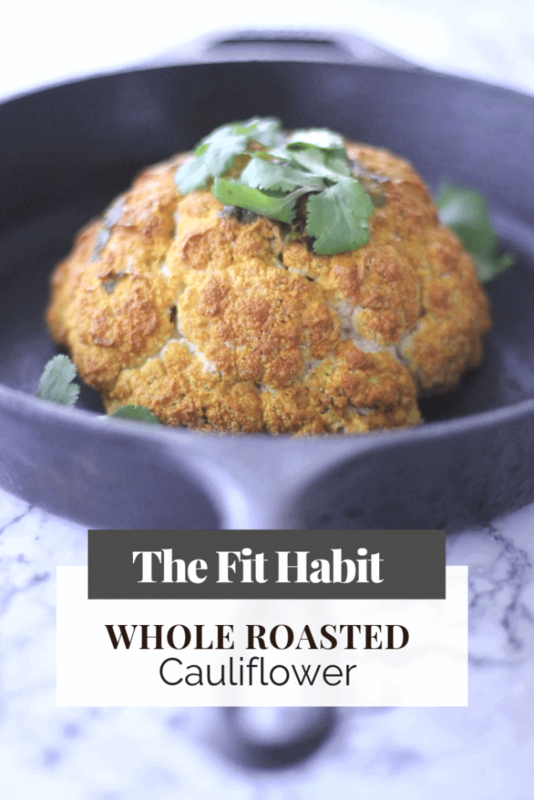 This roasted cauliflower looks beautiful! I love the bright color. You could have fooled me into thinking it was dipped in panko bread crumbs and deep fried. Very creative recipe!